Tesla Motors co-founder Elon Musk has a habit of making products that people don’t want. 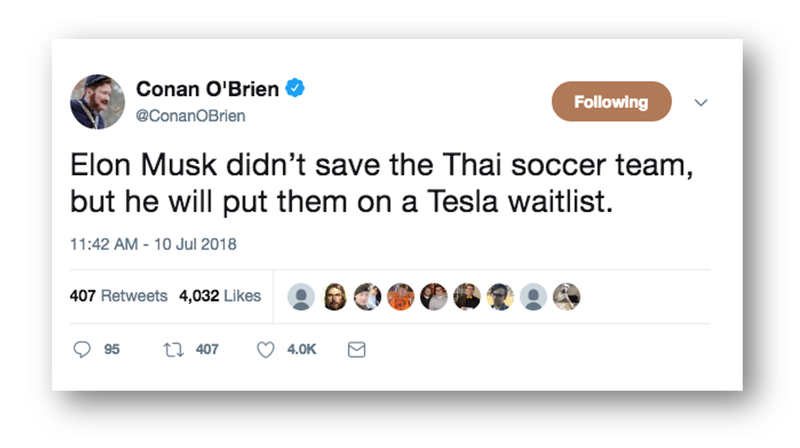 They are often too expensive (flights to Mars for $6 million and “a good chance you will die”); wildly impractical (a submarine too large to rescue the Thai soccer players trapped in a flooded cave); or both (the $140,000 Tesla Model X P100D “with Ludicrous Mode”). But despite his penchant for expensive and wildly impractical products, Elon Musk manages to keep his various enterprises afloat through generous government subsidies. According to The Los Angeles Times, Musk’s three largest companies—Tesla Motors Inc., SolarCity Corp. and SpaceX—have benefited from an estimated $4.9 billion in government support. Last month in an effort to become profitable, Tesla even asked its suppliers to “subsidize” the electric vehicle company by returning a “meaningful amount of money” that Tesla had paid them since 2016. Those government subsidies and the promise of the “first mass-market electric vehicle”—the $35,000 Tesla 3—have persuaded more than 400,000 people to plunk down a $1,000 deposit when Tesla unveiled the “affordable” EV in March of 2016. But so far, that car doesn’t exist. There’s an “all-wheel-drive” Model 3 starting at $54,000. And there’s even a “high-performance” Model 3 going for $78,000. But the affordable Model 3 is a long way off. As Musk tweeted in May, “Shipping min cost Model 3 right away wd cause Tesla to lose money & die.” Tesla says they hope to start production on the Model 3 by the end of 2018, but analysts suggest that it will be closer to 2020. And that will be long after the federal government finishes phasing out the $7,500-per-EV tax credit program that the first 200,000 Tesla buyers enjoyed. Naturally, this is angering these Tesla-owner wannabes. Last month CNN reported that 24% of Model 3 orders have been cancelled following news of the federal subsidy program phase-out. Analysts say cancellations have picked up in recent weeks and refunds now outpace deposits. Due to negligible consumer demand for EVs, subsidies are the life’s blood of electric vehicle sales. Tesla sales collapsed in Denmark following the announcement of their subsidy phaseout, from 2,738 in 2015 to just 6 in 2017. When Hong Kong eliminated subsidies for EVs in 2017, Tesla sales fell from 2,939 to zero. And China’s EV sales plummeted 61% that same year following a mere 20% cut in subsidies. Musk is well aware of this fact, so Tesla and other EV manufacturers are lobbying Congress to extend the federal subsidy in a desperate effort to sustain interest in a product that can’t sell itself in order to build public support for an industry whose time hasn’t yet come. But he is loath to admit it. The facts would argue otherwise.